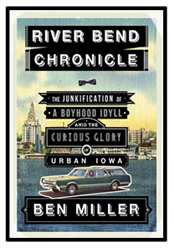 From a striking talent with keen powers of observation comes this evocation of an eccentric family’s tangled connections—between themselves, an unlikely cast of locals, and a seldom-documented urban Iowa, one not of cows and cornstalks but of thrift stores, TV dinners, and bridges spanning the muddy sprawl of the Mississippi River. By turns uplifting and harrowing, Ben Miller’s prose portrays a boy’s quest to make his life more than the sum of its worst moments in a chaotic household. The tableau revealed is endearingly adrift in time—an inventor’s dream of selling America on a mail-order ice rink, the neighbors whose prodigious cookouts have the gravitas of Greek drama, and the aspiring misfit writers who meet to quote The Elements of Style over Pall Malls in a riverside tenement. Through it all, Miller returns to his Virgil, neighbor Mr. Hickey, a bow-tie-clad widower who exhibits a beguiling power to bear losses without himself becoming lost. Together the unlikely duo forms an irrevocable bond, sipping Sanka and 7UP while tuning in to Muhammad Ali’s greatest matches or rooting for the beleaguered Cubs. Miller has engulfed the reader in the saga of a family fragmenting, and in the plight of a city redefining its identity at the close of a century. As characters converge and alter each other, the narrative current sweeps us toward a reckoning with secrets guarded for far too long.